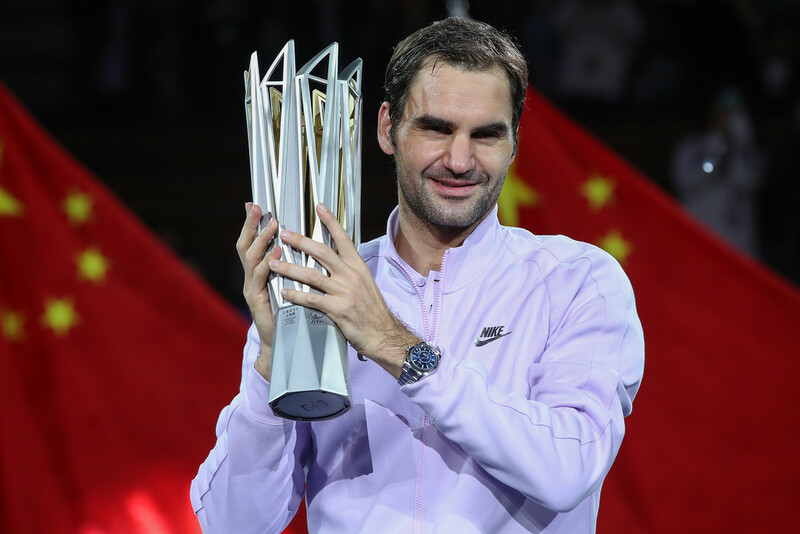 Roger Federer was at his ruthless best on Sunday, streaking to the Shanghai Rolex Masters title with a 6-4, 6-3 victory over Rafael Nadal. It was a vintage Federer performance, as the Swiss secured the 71-minute win with a dominant display, clinching a second Shanghai crown (2014) and 27th at the ATP World Tour Masters 1000 level. With the win, Federer notched his 700th match victory on hard courts and improved to 10-1 against the Top 10 this year. It was the 94th title in his storied career, which pulls him level with Ivan Lendl for second on the Open Era list. Only Jimmy Connors owns more trophies (109). Federer's 2017 campaign continues to set the bar, as the 36 year old added a sixth title and third at the Masters 1000 stage. 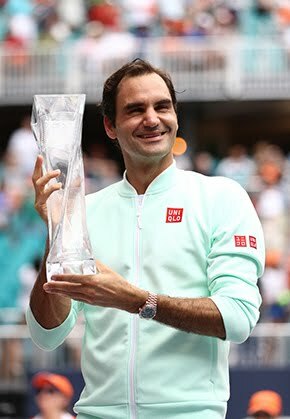 Having also prevailed in Indian Wells and Miami, it marks the fifth time in his career in which he has captured at least three such championships. Moreover, with the win, Federer draws to within 1,960 points of Nadal for the top spot in the ATP Race To London, with year-end No. 1 still very much in play. 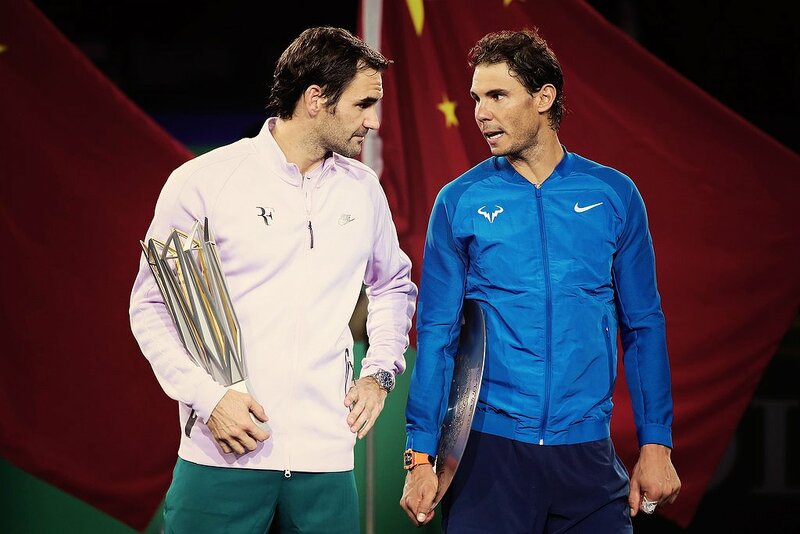 Both will be competing at the Swiss Indoors Basel, followed by the Rolex Paris Masters and ATP Finals. "I don't know what my expectations were going in. I had no nerves before the match, which was nice," said Federer. "I played a great match today with hardly any mistakes. It was very clear for me how I wanted to play and then I came out and started off very well. Felt relaxed from then on. I always know that Rafa can come back at any moment if he connects well, picks the right sides, and does the right things. "I even felt that way being up 0/40, you know, going for the double break, but, I had a clear game plan and felt I was playing well all week. I think that settled my nerves, because I was returning well from the first match here I played against Schwartzman. The serve only got better. I guess I saved the best for last. I played some good matches now against del Potro and also now these two sets. Nadal leads their ATP Head to Head rivalry 23-15, but Federer is doing his best to narrow the margin, having won their past five match-ups. The trend continued in Sunday's final, with the Basel native capitalising on the fast conditions under the lights on Stadium Court. With torrential rain drenching the Qi Zhong Tennis Center, the roof was closed for the blockbuster clash of titans. Federer was in control from the first ball, looking to break down Nadal's defence with an assault of forehands and backhands. The attacking Swiss made an immediate statement with a break in the opening game, carving a cross-court slice approach that caught Nadal out of position, followed by a boisterous backhand winner down the line. 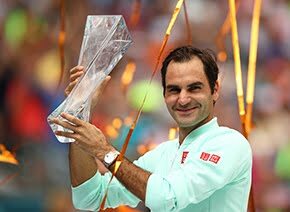 In each of Federer's three previous victories over Nadal this season - at the Australian Open and ATP World Tour Masters 1000 events in Indian Wells and Miami - the Swiss won more than 75 per cent of first serve points. His delivery was on song once again in Sunday's final, claiming 83 per cent of total service points in closing out a 6-4 first set. The second set featured more vintage Federer, as the second seed struck a stunning drop volley winner and forced Nadal to misfire on a forehand to claim the break for 3-2. Federer executed his gameplan to perfection throughout the 71-minute affair, sealing the win on his second match point when a Nadal forehand found the net. Federer has now won five consecutive encounters in their ATP Head to Head and is 4-0 this year. It marked the third time they have met on Chinese soil, with the Swiss scoring a pair of wins at the 2006 and '07 ATP Finals, when the season finale was held in Shanghai. "London is my priority now and I really want to win the World Tour Finals. I am very excited to have had the year that I have had and everything that comes from here is a bonus. Finishing the year as World No. 1 is a long shot, and I don't think it will happen. But if I play like this, who knows? Maybe I will get close again," Federer said. Nadal, meanwhile, was bidding for a record 31st ATP World Tour Masters 1000 title. The 31-year-old Spaniard suffered his first defeat since returning to No. 1 in the ATP Rankings in August, seeing his win streak snapped at 16 straight. He was appearing in the Shanghai final for the second time, having finished runner-up to Nikolay Davydenko in the tournament's inaugural edition in 2009. "It was a very difficult match for me," said Nadal. "He played very fast and he played well. I don't know how many unforced errors he made. I could have done some things better, but that's it. He just played too good. That's my point of view. So congrats to him. Soo well done, Roger! Congratulations! All the best for today at the Basel final! Go Rog!